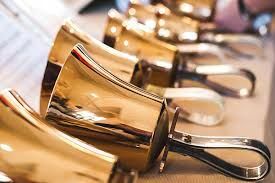 The Handbell Choir at St. John’s has a long tradition of ringing and camaraderie, but for that tradition to continue we need a number of new players. If you have any musical experience you can play bells. Note reading is not essential, as long as you can count! We are hoping to play for All Saints Sunday, November 4. Rehearsals are every Thursday (except Thanksgiving), from 5 - 6 pm in the Sherwood Room. Players from age 10 to adult are welcome to join. Contact Music Director, Steve Finch (631-423-3124, or 516-692-6368, x 5).